1. Preheat the oven to 180°C, gas mark 4. Lightly oil a deep 24cm loose-bottomed tart tin and place on a baking tray. Cook the broccoli in boiling water for 2-3 minutes. Drain well and cool under cold water then pat dry. 2. Place the eggs, crème fraîche and yogurt in a jug and beat together. Place the pine nuts in a small roasting tin and toast in the oven for 3-4 minutes until golden. 3. Unroll the filo on a work surface and work with 1 sheet of pastry at a time (cover the rest with a clean, damp tea towel until ready to use to prevent the pastry from drying out). Lightly brush the pastry sheet with the melted butter and lay it in the tart tin, allowing the pastry to hang over the edge. Repeat this with the remaining 2 sheets. 4. 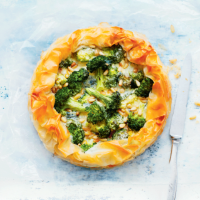 Arrange the broccoli florets in the pastry case then dot half of the Gorgonzola cubes and scatter over half of the pine nuts. Pour on the egg mixture and dot the top with the remaining Gorgonzola and pine nuts. Scrunch the pastry up around the edge of the tart allowing it to fall over the edge of the filling. Place in the oven and bake for 45-50 minutes until golden and the filling is set. Leave to cool in the tin for about 10 minutes before removing. Serve warm or leave to cool completely.